Benjamin Netanyahu has one of, if not the hardest job in the world. Arguably, the position of American President is also very hard however, that nation is so large that the effect of even devastatingly wrong decisions are not felt immediately. Israel is a country balanced on the edge of a knife. Sneeze in the wrong direction and everything goes up in flames. Every day the Prime Minister of Israel has life and death decisions to make. The results of incorrect decisions come fast and hard – economic imbalance, busses exploding in the streets or towns under siege. Anything can happen. The man in front of me was the same man that one week earlier stood in front of the United States Congress and the world to speak for his people, against American capitulation to Iran, for the right of Jews, Israelis, to live without the threat of annihilation. This man braved condemnation at home and abroad to speak for all of us. To speak for me. To speak for those who pour accusations and hatred on him. Many Israelis parroted the tune of our all too left leaning media “He’s only going because of the upcoming elections. His speech will be an election speech.” I believe it is our left wing politicians who taught this tune to the left leaning Jews of America and to American politicians. They will do anything to gain power. The Israeli media proclaimed their deep concern that Prime Minister Netanyahu would forever damage the relationship with America by defying Obama and explaining in a public speech that Obama’s choices are endangering Israel and the world. How dare Netanyahu say “NO” to the most powerful man on the planet?! They called it an “unprecedented breach between the countries”. I didn’t hear a single mention of a man in the office of President allowing himself to show unprecedented hatred towards the leader of the Jewish nation and blatant disregard of our right to live without fear. The Netanyahu I saw in front of me was not the courageous, eloquent leader that spoke on the world stage. The man I saw was tired. And worried that our nation would be handed on a silver platter to people that do not know how to say NO to America. Millions of dollars are pouring in to Israel from special interest groups funding the campaign against Netanyahu. There is no better option for Prime Minister so they have not upheld an opposing candidate but rather campaigned that “anyone is better than him.” The marketing machine is well oiled and working in every sector of society to convince people to vote against him. They say that the cost of living is too high because Netanyahu didn’t do enough to fix it. There is no mention of how strong the Israeli economy is, particularly in comparison with the collapsing economies of other nations across the globe. Yes there are problems. Things are expensive. There are people who don’t have jobs or have part time jobs that do not pay enough. We also have a stable economy and greatly reduced unemployment levels – all due to the economic policies of the Netanyahu government. They forget that cost of living doesn’t matter one bit when you are not allowed to live. The threats of Hamas, Hezbollah, the Islamic State as well as Arabs that live within Israel and work against this nation in violent and political ways are much more immediate and serious threats than whether or not a person can afford to buy a house. Being forced to rent rather than buy a house of your own is not an existential threat. The issue of “making peace” with our neighbors is a non-issue. To me it is bizarre that some people, too many people, still prefer to close their eyes to the harsh reality. It is not possible to make peace with someone who wants you dead. It is not possible to live peacefully side by side with someone who feels that your very existence is an affront. The people of Europe are beginning to learn that “occupied territory”, Israel or even Jews are not the problem. The Nation of Islam is spreading to all territories. Jihad is not about “right of return” it is about the dominance of Islam everywhere. 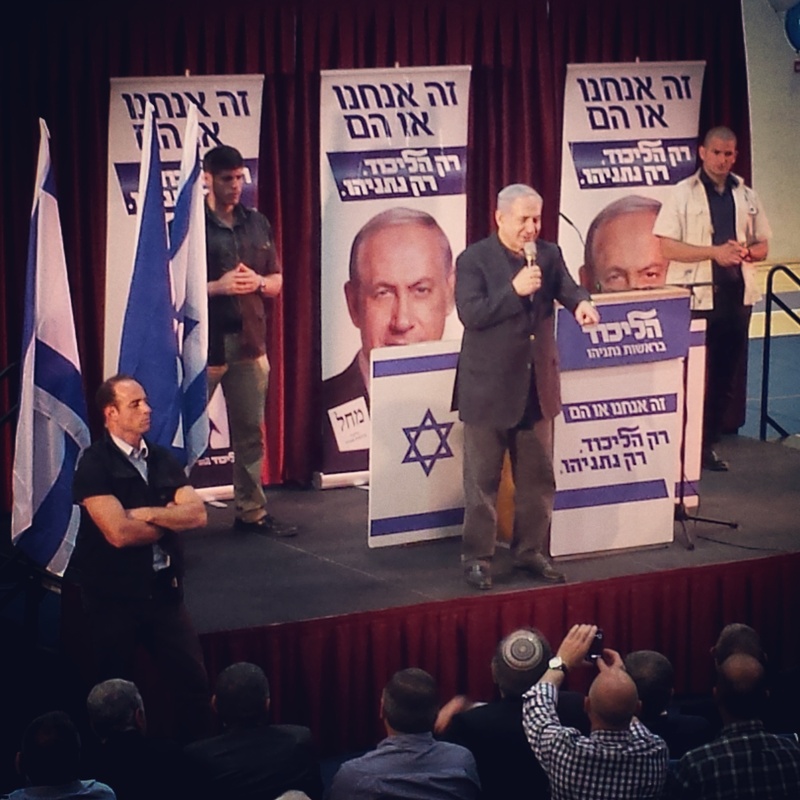 Watching Benjamin Netanyahu speak, just a few meters in front of me I felt awed by the pressures this man stands under. He has been standing in the breach for Israel, for many years now. Love of power is not enough to take on such a terribly difficult position. He has said it many times – he is not just the Prime Minister of Israel, he is the Prime Minister of all the Jewish people. He speaks for me. He speaks for the people that love him and for those that hate him. Netanyahu is not a perfect man or leader. No one is. He has made many plenty of mistakes, done things wrong and alienated a lot of people. The one things I know for certain is that there is no one who can do the job better.